Gingerbread Cut Out Cookies are perfectly spiced shortbread dough that holds shape in the oven! 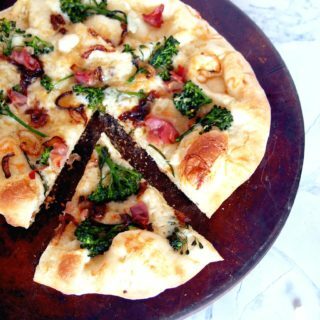 You won’t find an easier, more flawless recipe! I swear that my boys will happily eat vanilla bean buttercream with a spoon if I let them. They pile the frosting and sprinkles on cookies so thickly that it’s hard to tell that there is in fact a cookie underneath. I prefer a more simplistic approach with a gentle outline, and maybe a sprinkle or two. One thing that we can all agree on is that the chosen cookie recipe must be simple to make, easy for my kids to work with, and flawless enough that it won’t spread in the oven while baking. No one wants to decorate a gingerbread man that turns into a blob on the half sheet pan in the oven. 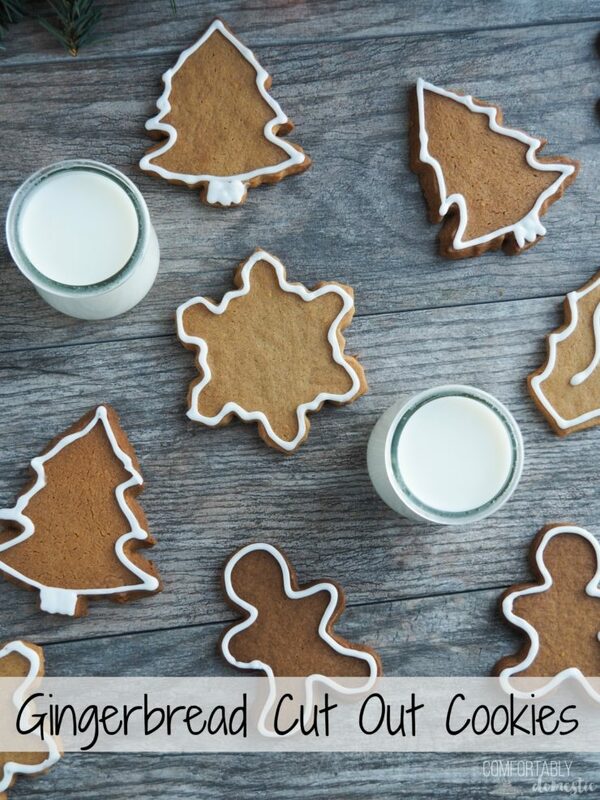 And speaking of gingerbread men, this is my go-to gingerbread cut out cookies recipe! For my Gingerbread Cut Out Cookies, I start with my favorite shortbread cookie recipe. No, seriously. 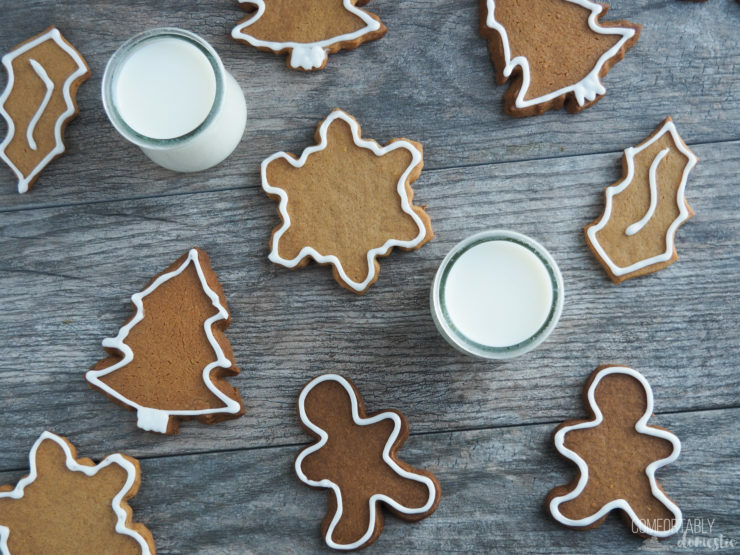 I’m so in love with this recipe for holiday cookies! I use it as the basis for my swirly peppermint shortbread pinwheel cookies, shortbread linser sandwich cookies, and my super easy decorated shortbread cut out cookies. Adding classic warm spices and a touch of light molasses to make these Gingerbread Cut Out Cookies isn’t much of a stretch. In fact, it is the most delicious idea that I’ve had this holiday season. The resulting Gingerbread Cut Out Cookies have all of the delicious flavors of gingerbread, with the crisp-chewy texture of shortbread. Frost the cookies with my vanilla bean buttercream or use this super simple royal icing that is made without eggs. 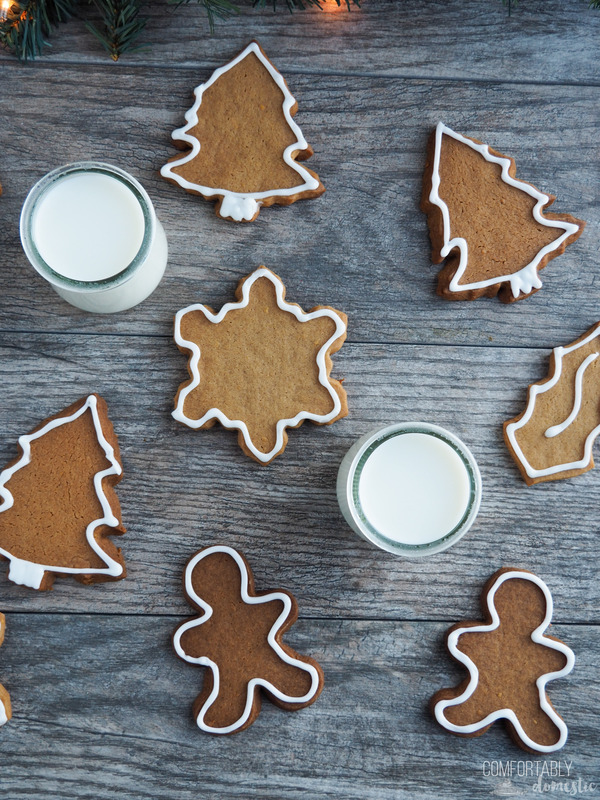 Try Gingerbread Cut Out Cookies and you’ll see why I’m so in love with the recipe! Gingerbread Cut Out Cookies are made from perfectly spiced shortbread dough that holds shape in the oven! You won't find an easier, more flawless recipe! Preheat oven to 350 degrees. Line several half sheet pans with silicone baking mats or parchment paper; set them aside. Place the butter and sugar in a large mixing bowl, and combine it on medium low speed, until it looks creamy, and has lightened a bit in color. Stir in the vanilla extract and molasses until blended. In a medium bowl, measure the flour, baking powder, baking soda, salt, cinnamon, ginger, cloves, and cardamom. Whisk the dry ingredients to combine. Add the flour mixture to the butter mixture in 2-3 batches, stirring well in between until the dough starts to come together in a soft mass. Lay a large piece of plastic wrap on to a clean, flat surface. Dump the dough onto the plastic wrap. Form the dough into a ball, and then press it into a rectangle about ½-inch thick. Wrap the dough in the plastic wrap, and pop it in to the fridge for 20 minutes. Unwrap the chilled dough, and roll it out evenly on a lightly floured surface until it’s about ¼-inch thick. Cut desired shapes and place them 2-inches apart on the prepared baking sheets. Piece the scraps back together and roll out again to cut more shapes. Repeat until all of the dough is used. Bake the cookies at 350 degrees F for 8 to 10 minutes, or until the edges are very lightly browned. Larger cookies will take more time to bake than smaller cookies, so watch during baking and adjust the time as necessary. Remove from oven and cool for a few minutes on the baking sheet before moving them to a cooling rack to cool completely. Once cooled, cookies may be dusted with powdered sugar or decorated with a favorite icing . Recipe makes 3 to 4 dozen cookies, depending on the size of the cookie cutters used. Previous Post: « Weekly Menu Plan 84 remixes all those Thanksgiving leftovers!